You could almost summarize this cat in several words, a Siamese cat with longer fur but it is not quite as straight forward as that, not for me in any event. Gloria Stephens who wrote Legacy of the Cat, illustrated by Tetsu, deals with the Siamese, Balinese (in both shorthair and longhair) and the Oriental Shorthair all in the same section. Clearly the overlap is big. She calls this cat breed, “a ballerina in flowing skirts”. 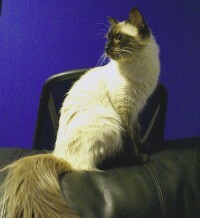 The Balinese is a pointed semi-longhaired Siamese cat. The long hair adds to or improves the Modern Siamese cat, I think. It is said, or it is accepted, that the breed originates with the introduction of a gene into the Siamese cat’s genetic make up that causes semi-long hair. This gene is recessive so its effects can be hidden for a long time. The question is, how was this gene introduced? The gene may have been in one of the early imports from Siam. Long haired Siamese cats appear to have been in existence in the Far East well before importation to the West. Or, it may have been a genetic mutation. A number of breeds are due to the mutation of a gene (e.g. Dwarf Cats). Finally, it is more probable that the Siamese or their offspring imported into Britain were out-crossed with long-haired cats such as the Turkish Angora. In other words the longhair gene was introduced into the Siamese gene pool in England between 1918 – 1939. Once the possibility of a long haired Siamese was presented to the Cat Fancy then in time it came about that a new breed was created and developed (well delineated from other breeds) through selective breeding. 1920s or before The appearance of semi-longhaired cats in Siamese litters. 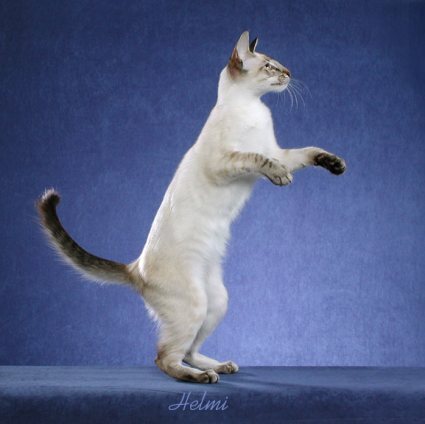 1928 Longhair Siamese registered with the Cat Fanciers Federation (CFF) – based in Ohio, USA. 1955 Breeding of the Balinese (perhaps initially referred to still as the Longhaired Siamese) began in earnest. This must have meant a breeding programme that ran in parallel with the Modern Siamese as until about 1950 there was only one type of Siamese namely the Traditional Siamese or Applehead Siamese as the breed is now called. There is also the “intermediate” Thai cat. Accepted in the USA for registration in same point colors as the Siamese – accepted as a separate breed. The breed was accepted for championship status by CFF. 1970 CFA recognise this cat and call it the “Javanese”. 1979 Additional colors where introduced and registered in USA – red, cream,tabby etc. Became an established championship breed on the formation of TICA. This page is about traditional Balinese cats, a page written by Marie Clements a breeder of traditional Balinese and Siamese cats. This is a narrative version of the above tabled history and provides more detail. Athena, the cat in the two photographs above, would be a Lynx Point Balinese if she was registered with TICA (The International Cat Association). If she was registered with the CFA (Cat Fanciers Association) she would be a Javanese, a separate breed. Click on the link to see a Lynx point Siamese . 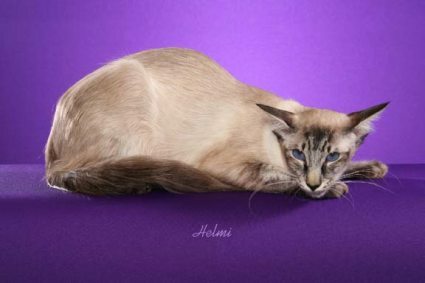 This is because the CFA only register the conventional Siamese point colors for this breed, namely seal, lilac, chocolate and blue (the solid colors). Whereas the other associations, including TICA allow registration of all the additional point colors namely, lynx (tabby), tortoiseshell, flame (red) and cream. The lynx point incidentally is the tabby gene having an effect on the points of the cat (i.e. causing the classic “M” marking on the forehead and banding on the limbs). To complicate matters more, in Europe a Javanese cat means an Oriental Longhair with a solid-color. This is confusing and it is probably time to rationalize the various criteria for registration and the breed names. When discussing the Balinese it is impossible not to mention the Siamese cat and it could be argued that the Balinese and the Javanese are types of Siamese cat . Photo of Kareem (top) and Samson (bottom) © Helmi Flick. These are large thumbnails. You can click on them to see larger versions. All “narrow triangles and tube” – I like that. It comes from Legacy of the Cat. The face is very triangular and the body tubular. The Balinese cat’s elegant and stylish appearance is in contrast to this cat’s demonstrative character and desire to clown around. Apparently he or she is a little less vocal than the Siamese (who is known to be vocal). This breed may have a slightly softer voice than the Siamese. Gloris Stephens says that the Balinese is “vocal to the point of loudness”. They are quite active too. The Balines cat likes the company of his or her owner and want to be as close as possible. This cat is intelligent, which may sometimes be demonstrated in demanding behavior. The response from us should be to hold it and stroke it; to talk to it and ultimately love this fine cat. It is thought that the Siamese and Balinese are in the top rank of cat breed intelligence. 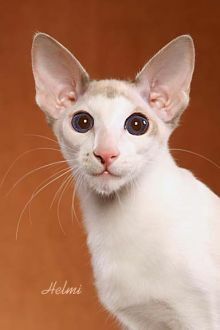 Well actually the Siamese is but it is far to include the Balinese as well. In fact the Balinese is the most intelligent of the long haired cats. Persians are probably the least intelligent. It seems that the Balinese cat’s intelligence serves this cat well in being able to adapt more easily and this might mean getting along with children and other animals. It also depends on how well adjusted the individual cat is. Sometimes the character of the individual cat outweighs the cat breed characteristics. See cat behavior. The photographs of the cats that you see on this page are the equivalent of the Modern Siamese in body conformation. As is the case for the Siamese cat, there are two types of Balinese Cat, the Traditional and the Contemporary. This page features the Contemporary. A Traditional Balinese is illustrated opposite, right. They are sometimes called “Applehead Balinese” in the same way Traditional Siamese are called “Appleheads“. Click on the links to read about the history of the Balinese cat and the history of the Siamese cat, which are intertwined. For the Traditional Balinese the coat is about 2 inches in length all over. There are 2 cat associations that are concerned with promoting traditional cats including the Traditional Balinese. These are the and The Traditional Cat Cub (new window). The Traditional and Classic Cat International (TCCI) call the Traditional Balinese the, “Classic Balinese”. For Siamese cats the word “classic” is usually used for cats than fall in between the traditional and the modern. Their breed standard emphasizes the need for a balanced cat (meaning in proportion, no outstanding elements). The fur has no undercoat (this should help in minimizing grooming maintenance). TCCI allow the classic pointing of seal, blue, lilac and chocolate. 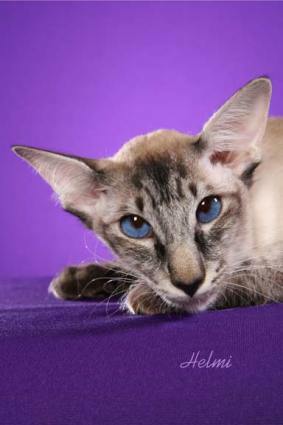 In breeding back to Siamese cats, breeders produce short haired Balinese, which they call Variants. This process is important as it improves type and eye color (appearance more inline with the breed standard). Variants are fine cats but obviously not show cats. The Traditional Balinese cat could be confused with the Himalayan cat (a color pointed Persian cat). They look similar but the Doll Face (Traditional Himalayans) have more rounded faces and are more cobby and have much denser fur (higher maintenance). Click on the link to see a fine Himalayan and see what you think. Another cat that is similar in some respects is the Ragdoll, another long haired cat. Ragdolls can have pointing that is the same as a Balinese. But often they have white fur on the points (like the Snowshoe) and mitted feet. The main differences are that the Ragdoll is a larger cat and it has a more docile character (hence the name of the cat). Ragdolls though have fur similar to Balinese cats, silky and fine but it needs more grooming. The Ragdoll is also thought to be less intelligent, less active and less vocal. Balinese are mid ranged in weight and size. The contemporary Balinese cat being so closely associated with the Modern Siamese cat that it may have inherited some of the health issues of the Modern Siamese. The traditional cats are generally more healthy and this is the case with the Siamese cats. I discuss general cat health on this page. One last point, click on the following link to see some information about Balinese cat genetics. 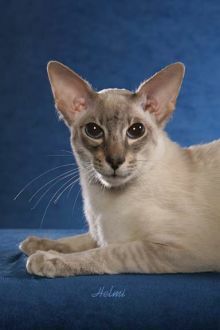 Balinese and Siamese Cat Club – UK located and a well established club being founded in 1988 (their website link is broken). 1. Legacy of the Cat – Gloria Stephens and Tetsu. 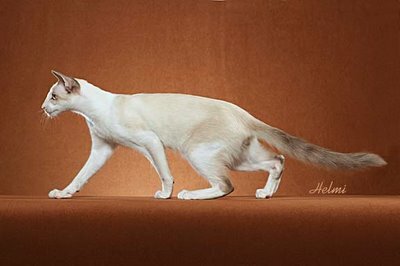 This entry was posted in Cat Breeds and tagged balinese cat, Javanese cat, siamese cat by Michael Broad. Bookmark the permalink. 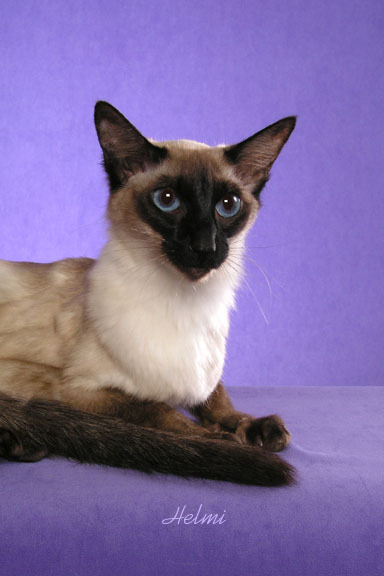 Balinese are only in the traditional colors of the Siamese–Seal, blue, chocolate, and lilac points. All the other point colors are Javanese.